Suitable and profound educational materials of Price Action strategy is available in Education section. This strategy is completely described in session 86 as well. 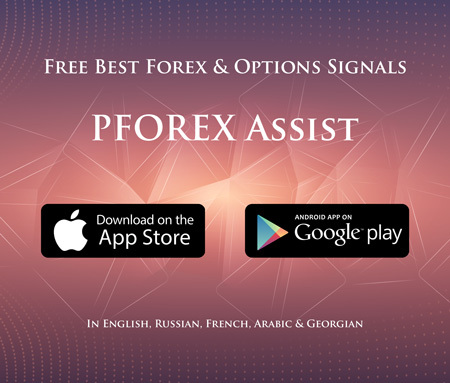 PFOREX Assist detection system applies the Price Action strategy based on Classic Chart patterns like Head & Shoulders and Double Top/Bottom to deliver highly powerful short/long term signals. The generated signals, based on Price Action strategy, are confirmed by other patterns and strategies such as Dark Cloud Candlestick or Overbought/Oversold conditions by RSI and Stochastic. Bullish format: A powerful pattern was formed that has identified bearish trend that finally hit the Take Profit price of that pattern. After some traders close their trades since the Take Profit price was crossed, a reversal spot can be detected and supported by other confirmations like a powerful bullish candlestick pattern. When RSI line passes the level 30 or Stochastic line passes the level 20 toward top then the upward trend is confirmed as well. Bearish format: A powerful pattern was formed that has identified bullish trend that finally hit the Take Profit price of that pattern. After some traders close their trades since the Take Profit price was crossed, a reversal spot can be detected and supported by other confirmations like a powerful bearish candlestick pattern. When RSI line passes the level 70 or Stochastic line passes the level 80 toward bottom then the downward trend is confirmed as well. On the EURJPY symbol, after a bearish Triangle pattern formed, price decreased until it crossed the 1st Take Profit price, equal to the half of that pattern height, and then a Hidden Bullish Divergence was detected to confirm the upward trend. After RSI line passed the level 30 toward top, then the reversal spot was identified. The next example shows a Double Bottom pattern on the bearish trend, hence price increased until the 1st Take Profit price. After confirmations from Stochastic and RSI, the bearish signal was generated.